High end game peripherals can give you an enormous advantage over your opponents. Having the right equipment can help improve your practice, and it can be more immersive and fun to play with. However, finding the right peripherals can be a little trickier. Because different hardware is made for different types of gamers. In most cases, casual players and competitive players aren’t going to be searching for the same things. After all, someone who’s spending 6-8 hours practicing their technique can get more from small improvements in design than someone who’s only playing the occasional match. As far as gaming brands go, Victrix is a basically newcomer to the marketplace. But while a lot of new brands focus on making budget equipment aimed at people who want to save a few bucks, Victrix seems focused on making gaming peripherals with more of a high-end feel. Their Pro FS Arcade Fight Stick is an attempt at creating a high-end stick that’s equipped to be played in highly competitive fighting games. The problem? You can find pretty good arcade fight sticks from Hori or Razer for around $200. Both those brands have made very impressive fight sticks, and both have products which are already widely used by some of the best players out there. 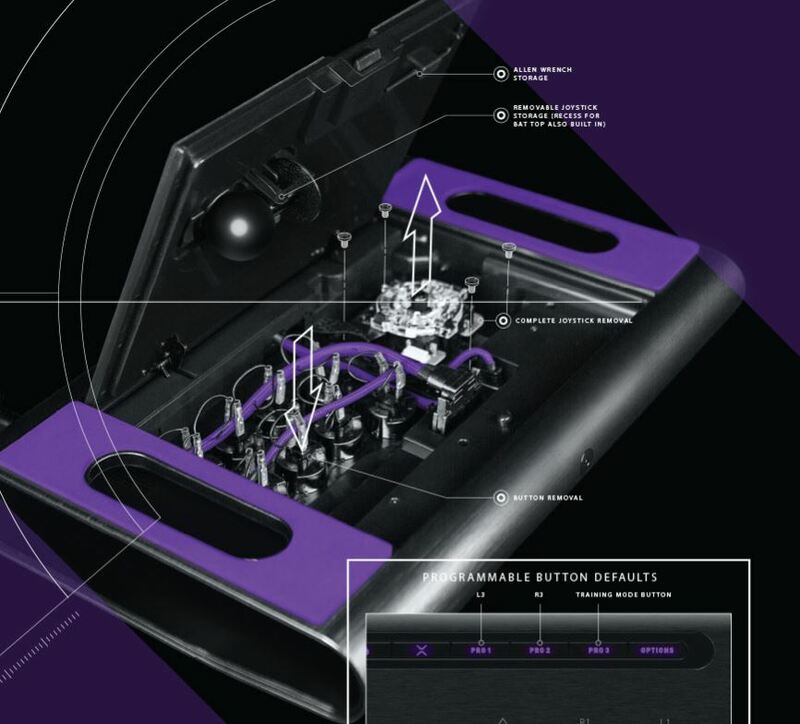 Costing almost 50% more than those cheaper alternatives, the Victrix PS4 FS Arcade Flight stick had better be able to bring some great stuff to the table. So what sets apart this fighting console? It’s mostly a matter of design and detail. Nearly every square inch of this console was made with some kind of intent behind it. It’s also pretty clear this fight stick was made for someone who’s logging more than a couple of hours of playtime each week. 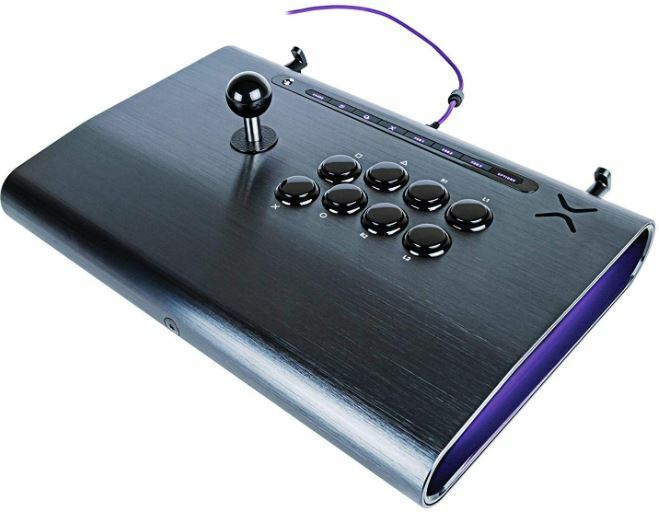 The Pro FS Arcade Fight Stick is primarily made from aircraft grade aluminum. 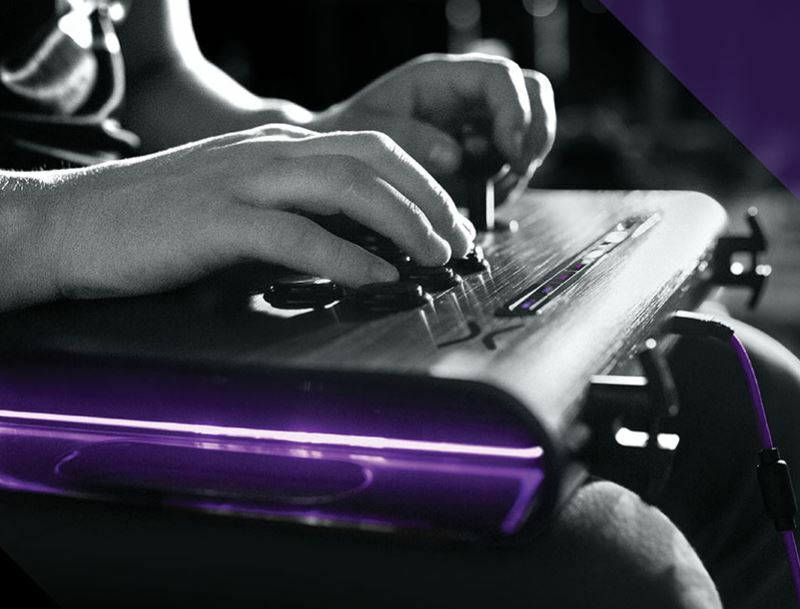 Its lap-sized body measures 16.25″ x 11″ x 2.25”, which is pretty much the size of a full arcade cabinet fight stick platform. Because the body is anodized aluminum, the front side has some beautifully smooth curvature. With respect to aesthetics, Victrix spent a lot of time and effort to ensure this pad looks great. Their logo is fairly subtle, and the purple braiding around its USB cable is both sturdy and on-theme. From top to bottom, this fight stick gives off a high-end vibe. And that’s before you start using it. The palm area of the chassis was constructed with a gentle slope to help naturally accommodate a player’s wrists. The combination of metal and curvature feels better than a flat plastic surface, and it feels better than having your wrists impact against hard edges. For someone who’s going to be logging several hours of consecutive play on their fight stick, that kind of small difference in comfort can matter quite a bit over time. The bottom of the device is made up of some soft pads that help encompass most of the surface on the underside. Those pads help keep the Pro FS feeling comfortable on your legs, even as hours of play pass by. Including extra cushioning is a little unusual compared to a typical plastic fight stick, but again, when you’re playing for several hours, it can make a world of difference. You’ll find a total of eight Sanwa Denshi action buttons in the control layout. Likewise, the joystick is a Sanwa Denshi JLF Square Gate build. Basically all the right components for making a natural feeling fight stick. But we’ll get into the controls of this stick a little later. It’s also worth noting that the interior of the fight kit can be accessed through a door on the bottom of the unit. That way, the Pro FS can be further customized. The interior might not be able to fit every type of custom part because it’s actually quite compact. There’s a very subtle degree of RGB lighting, too. The top row of buttons and the side recesses are all capable of lighting up. Because there are a pair of handles on either side of the base, it’s quite easy to haul this fight stick from one place to another. Pretty good for the potential of tournament play, but equally good for setting up a few rounds on the couch in your living room. It’s even easy to hang-up using those handles, if you’re looking for some creative storage options. Given the pleasant aesthetic of this fight stick, hanging it wouldn’t be such a bad idea. 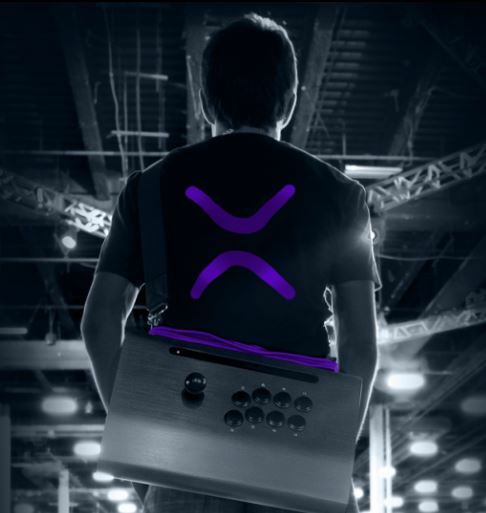 But handles aren’t the only thing the Pro FS Arcade Fight Stick can offer for portability. Even more pertinently, the joy stick can be popped off for storage. For those who are pretty active and aggressive players who find themselves thrashing at the joystick during play, there’s no reason for concern. Fortunately, it’s not too easy to remote the joystick. It actually requires you to hit a switch to remove it, helping ensure that it only comes off when intentional. So you won’t find yourself doing it accidentally during play, or anything like that. Where do you store the joystick when you pop it off? Well, on the inside of the flight stick chassis, there’s a little space to store the joystick or other small peripherals. This opening also opens up a number of modification possibilities, which are only limited by the relatively small space available to you inside the Pro FS. One of the most notable port features is how Victrix includes a 3.5mm headset jack. That jack does not only handle audio-in, but it also audio-out, preparing you for two-way communication. The backside of the fight stick features a USB-C port that’s been slightly recessed into the chassis. Pretty stylish and highly forward-looking, ensuring this fight stick is capable of performing years in the future. With respect to its gaming performance, there’s only a few important things to point out. First and foremost, like you’d expect, the Sanwa joystick is highly responsive. The joystick provides audible clicking alongside tactile clicking when you rotate it, which helps your arm get the feel for handling the control. Whether you’re playing with precision or you’re smashing away at the panel, the entire interface very touchable. Each button sinks into the chassis and then eagerly snap back into place, with the kind of accuracy that surpasses what you’d find in a lot of arcade cabinets. Again, that’s because the Pro FS is constructed around highly reliable Sanwa switches. Where you can feel that most is on-screen. Because input latency is 5ms, which is basically as good as any wired mouse or gaming controller. And that’s the kind of accuracy you need to pull off frame-for-frame accuracy in a lot of the best fighting games out there. In short, though this stick probably won’t make you a better player overnight, it can help ensure your equipment isn’t what’s getting in the way of your victory. The Pro FS was made for the PlayStation 4. There’s an Xbox One version that’s in the works, but the PS4 version is the only one out right now. Luckily, the PS4 version has PC compatibility as well. But actually getting it to work on the PC can be a minor chore, even for playing common games on Steam. It’s not very difficult to map button controls in a game, but Victrix has players switch settings around in a usual manner. Switching the controls requires the player to press the Victrix button while holding the joy stick in a particular direction. Like with playing on the PC, this can be a minor chore to do. But once you actually get past the setup, you’ll probably find the performance is marvelous, within the limits of compatibility. The backside of the unit comes with a pair of T-cable wraps that help bundle up the 10ft purple USB cable. Speaking of that USB cable, it’s great Victrix built their kit with a non-proprietary cable, so replacement would be quite easy. There is also one more pair of cable wraps which allow shoulder strap to clip to them, though no shoulder strap is included. 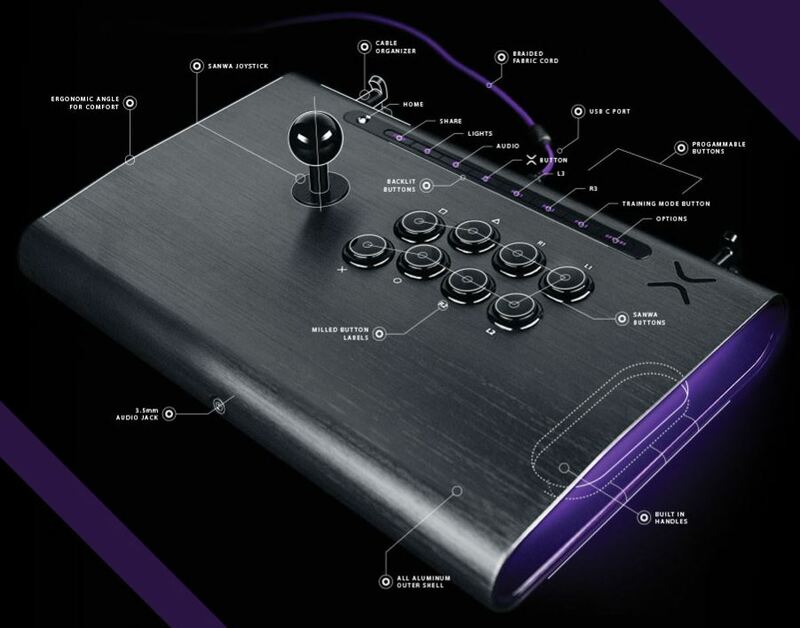 This kit does include the Pro FS Fight Stick, Link 2 detachable shaft and ball top attachment, an extra ball top grip and joystick shaft, dust cap and detachable shaft, an Allen wrench, a pair of removable die-cast metal wrap extensions, and a 9ft detachable braided USB cable. 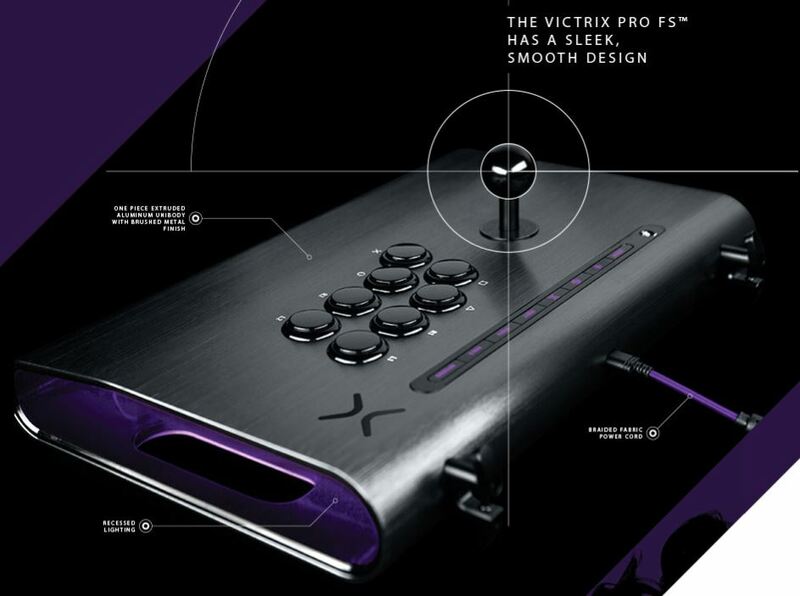 Who Should Choose the Victrix PS4 Pro FS Arcade Fight Stick? The Pro FS Arcade Flight Stick probably isn’t right for casual gamers. Because this is really only something an avid fighting game fan would want to use. Not only someone who loves the genre, but someone who’s proficient enough to use the gear. Casual players, or players who were just starting to learn, might be better off with something a little more entry-level. 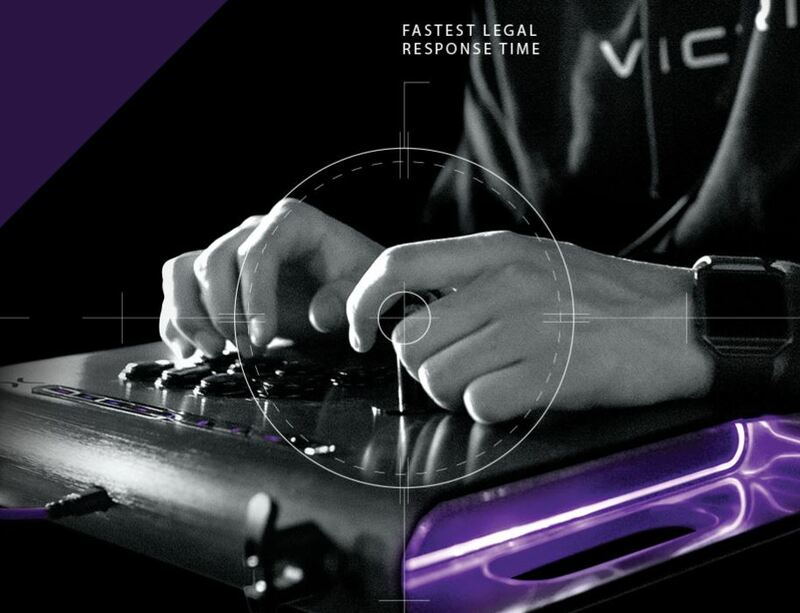 However, some people can actually take advantage of the differences in quality between the Victrix PS4 Pro FS Arcade Fight Stick and mid-range equipment. For those people, it’s fair to say that from a hardware perspective, this fight stick is nigh perfect. The feedback is flawless, and several aspects of its design can be reworked or otherwise customized as necessary. The Pro FS combines performance, comfort, aesthetics, travel options, and a touch of expandability. It’s quite clear this equipment was made with direct feedback from fighting game champions because the entire design is about fast response times, which can make the difference between a successful block or a failed technique. The only bad thing about this pad is it can take some work to setup as a PC peripheral. That’s actually a pretty common complaint that can be levied against many similar fight sticks, especially those which do not have their own software suites. But when you’re considering top-tier equipment like the Victrix PS4 Pro FS, even these minor complaints are worth mentioning.